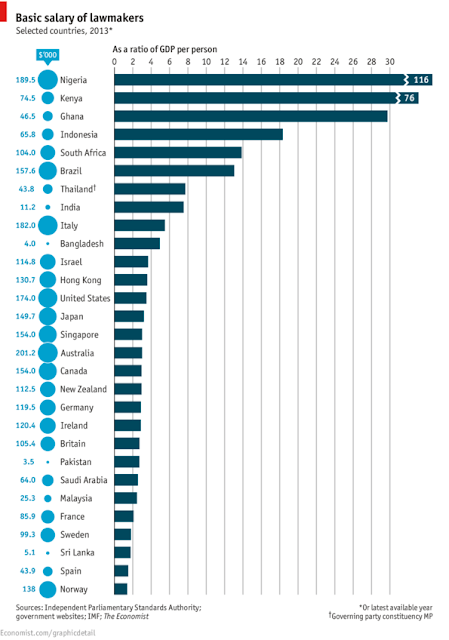 The graph below published by the Economist is more than just an eye-opener but it is also revelatory about how political office is a parasitic drain on the national resources since politicians cannot be considered part of the economic engine of a country. What makes this graph worthy of the most righteous indignation begging for public insurrection is not so much about what the politicians earn, but the gap in earning capacity between the citizen and the representative lawmaker. Australian lawmakers earn the most at $201,200 followed by Nigeria at $189,500 and then Italy with $182,000 and the United States at $174,000 all compared to the people they represent, we find that Australian and American lawmakers earn less than 4 times the average economic activity of their countries divided by their populations (GDP per capita), Italians just about double that and Nigerian lawmakers earn 116 times that. The World Bank, the IMF, the CIA and the University of Pennsylvania all put the GDP per capita of Nigeria at between $2,661 ranking 137th in the world out of 180 countries, $2,720 ranking 143/187, $2,800 ranking 148/194 and $1,716 ranking 152/185 respectively. By comparison Australia is in the top 10 thrice, Italy in the top 30 twice and then the top 35 and the United States of America 4 times in the top 10, it goes without saying that Nigeria has no business paying its legislators in what is purportedly a representative democracy these atrocious amounts of cash that bilk and milk the country without contributing anything to its economic growth. Worse still, it creates a competition for political office where the rewards far outweigh the commensurate perspiration leading to many situations where power-grabs by every means possible warps every notion of free and fair elections, talk less of representative democracy – it is utterly bad for Nigeria apart from the fact that it is unsustainable. Looking at the chart again, you also wonder why Sub-Saharan African nations that hog the bottom third of GDP per capita tables are the ones that take the lead by far in the discrepancies between elected and elector besides the fact that only Ghana has consistently rewarded its electorate with the will of its people, Kenya did not in the penultimate election which has the current leadership indicted for crimes against humanity and Nigeria is a travesty in everything but name. Nigeria is awash with oil money in the wrong hands which is used in acquisitive, ostentatious, hedonistic and wanton display of power, wealth, influence and mischief, it exacerbates a pressure cooker of ethno-religious and regional tensions, none of which the leadership have had the wherewithal to grapple with or understand that the consequences as it holds together with threadbare allegiances of snouts in trough might well be dire for the 2015 election year. In my humble opinion, this democracy is neither representative nor working if the people we choose to represent us are so far removed from the reality of the citizenry that they literally live in a parallel universe, there ought to be no reason for Nigeria, Kenya and Ghana to be democratic outliers compared to the economic activity within their regions in comparison to their people, it calls for reform and this must be urgent, radical, far-reaching and deeply examining of the culture of corruption and influence-peddling we have allowed to become the raison d'être of political life. This is the one time when the chorus from the village to the city and from the homes to the marketplaces of the country should ring loud – Enough is just enough.